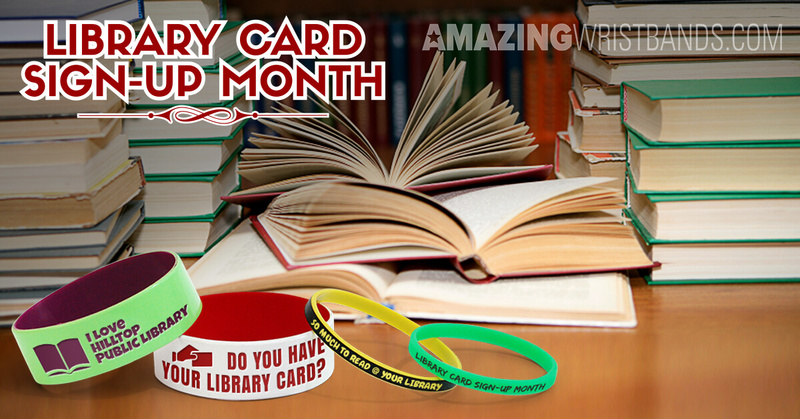 September is Library Card Sign-up Month. In the weeks leading up to this important months, campaigns around the country are promoting the library card as the most important school supply of all. There are so many benefits of students being connected to their public library, and it's important to raise awareness so parents and kids get library cards before school starts. Library wristbands can help promote local libraries and remind students to use library resources throughout the school year. Custom wristbands for your library can have a personalized message specific to your local library, or something more generic. A bracelet with the message, "Do You Have Your Library Card?" or "I Love Hilltop Public Library" can help promote library programs. When you order wristbands from www.AmazingWristbands.com, you can create your own wristband using custom colors, artwork, and more! All our quality silicone products that latex-free, and non-allergenic. Many of our bracelets have no minimums and can be delivered within a few days. Use our online builder to create your wristband, or give us a call if you need help. We offer free shipping, free artwork, free design, and free color matching Best of all, your Library wristband are completely customizable! According to the American Library Association, the Library Card Sign-up Month was first launched in 1987 to meet the challenge of then Secretary of Education William J. Bennett who said: "Let's have a national campaign...every child should obtain a library card - and use it." Since then, thousands of public and school libraries join each fall in a national effort to ensure every child does just that. In most areas, library cards are free to people living in the library's service area, and students can have their own card, inspiring a sense of pride and responsibility. Throughout American history, libraries have played an important role in the education and development of children. Studies show that children who are read to in the home and who use the library perform better in school and are more likely to continue to use the library as a source of lifetime learning. In addition to books, magazines, CDs and DVDs, computers, games, software and other multimedia materials, libraries increasing offer access to e-books and e-book readers. Seventy-six percent of libraries offer access to e-books, an increase of 9 percent from last year. Mobile devices, including e-book readers are available at 39 percent of libraries. National read a book day - Its time to motivate your kids to read a book!